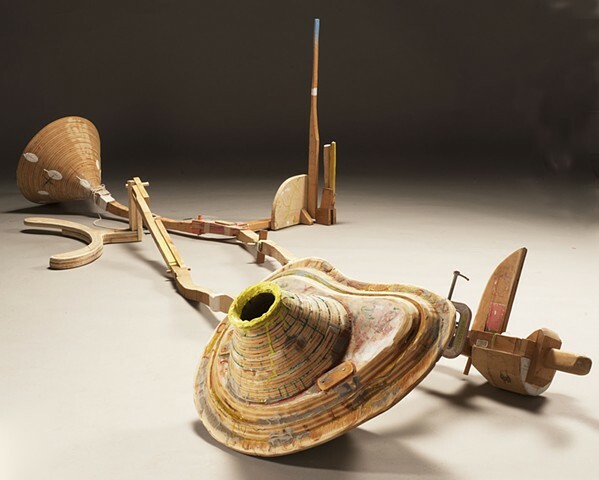 These sculptures are outgrowths of my Renovated Flightless Devices series and play off the forms and function of tools, toys, boats, and, perhaps, military equipment. The works are somewhat vessel-oriented and have layers of drawing and painting that contribute to the building of a vague "history". The objects take a winding path to completion, evolving from continuously redrawn sketches and traveling through many transformations before being cut apart, reassembled, and reworked. Through this method of construction and reconstruction, I am able to intuitively build and then, at a later time, make necessary changes. Many of the recently completed things pictured here evolved for nearly a decade.